Born on August 31, 1821, in Potsdam, Hermann von Helmholtz was the eldest of six children of August Helmholtz, a teacher of philosophy and classics in the local gymnasium, and Caroline Penne Helmholtz, a descendant of the family which took prominent part in the founding of Pennsylvania. At the age of 17 he entered the Friedrich Wilhelm Institute as a scholarship student of medicine. Happily for science, Helmholtz had the genius to absorb medical and physiological training with the mind of a physicist. A great help in this respect was a teacher of his at the institute, Johannes Müller, the foremost German physiologist at that time, who insisted on carrying as far as possible the physical and chemical explanation in all problems of physiology. For Helmholtz this also meant the utmost use of mathematics, which he learned on his own to a very advanced degree by studying in his free time such mathematical classics as the works of Euler, Bernoulli, D'Alembert, and Lagrange. His doctoral dissertation (1842) described and analyzed the connections between nerve fibers and nerve cells, a discovery which he made by skillful use of the microscope and which forms the histological basis of the physiology and pathology of the nervous system. Helmholtz's scholarship status implied the obligation to serve for eight years as army doctor. His first post (1842-1843) was that of a house surgeon at the Charité Hospital in Berlin, followed by a stint of 5 years as assistant surgeon to the Royal Hussars at Potsdam. Despite time-consuming duties, Helmholtz found ways of developing his scientific interests. While at the Charité, he published a demonstration of the strictly chemical nature of fermentation and noted that a vitalistic account would be equivalent to assuming a perpetual-motion process. His papers on metabolism during muscular activity (1845) and on physiological and animal heat (1846, 1847) clearly indicated the great goal toward which his creative mind inevitably tended. In February 1847 he sent the first draft of the introduction of "The Conservation of Force" to Emil Du Bois-Reymond, who immediately declared that it was "an historical document of great scientific import for all time." The 26-year-old Helmholtz read the paper on July 23 before the Physical Society of Berlin. He was not the first to enunciate the idea that physical force (energy) was conserved in its various transformations, but his originality consisted in giving the principle a generalized mathematical form, which readily yielded expressions for kinetic and potential energy in mechanics, thermodynamics, electricity, and magnetism. 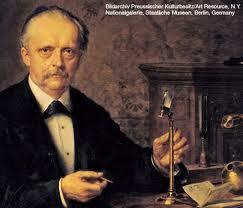 During this period Helmholtz began to achieve the status of a chief adviser to the state in scientific matters. He played a prominent part in the establishment of the Imperial Physico-Technical Institute (Physikalisch-Technische Reichsanstalt), of which he became the first director in 1888. Although a chief aim of the new institute was to carry out high-precision measurements, Helmholtz wanted the new institute to serve pure science as well as technology. During his last years acclaim and honors poured in from every side. His seventieth birthday became an occasion for nationwide celebrations. He died on September 8, 1894, after months of struggle with paralysis. In no small measure, through his inspiration physics in Germany rose to unparalleled heights by the end of the 19th century, a position which remained unchallenged for another generation. As a wholesaler of videogames, but this study shows it is a worthwhile investment for you. have the desire to be Paid to check videogames? Depth information is measured in real time and live environment. The boys from Double Dragon prowl the streets of Detroit. sensitivity, and we've seen effects that last up to two years," she told NPR in an interview.